This unique set of Cross Body Bags has many options to hold everything you need. Our set of exclusive cross body bags feature several unique options. 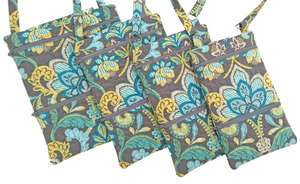 Each bag has 2 zippered pockets. Each pocket is fully lined and separate from the other. There are no raw edges anywhere inside these bags. Our Cross Body Bags are made completely in your hoop. All the bags have stipple quilting. The outside bottom pocket is perfect for a phone. The optional back pocket can hold a device and secures with a stipple quilted flap and snap. These bags can hold eReaders, tablets, etc. The 6x10 bag can hold an iPad Mini. The 9x10 bag can hold an iPad (2 or Air) in a case. There's an option for a credit card lining for each size bag. The 6"x10" & 7"x10" sizes have 2 columns of 3 credit card pockets that hold cards vertically. The 8"x10" & 9"x10" sizes have 2 columns of 3 credit card pockets that hold cards horizontally. Here is the 8"x10" bag with optional credit card lining turned inside out so you can better see the inside pockets and the optional key tab. It's all done 'in the hoop'! Also notice how nicely the inside of the bags are finished.